Sure Win is a term that is used to describe a 100% bet at a race, especially horse races. This is why it is a fitting name for this game that is themed around the world of horse racing. The game is a sure win, because once you place your wagers and start spinning the reels, there is nothing standing between you and the great payouts that the game has to offer. All of the symbols as well as the interface of the game are inspired by the horse racing theme of the game. Play Sure Win Slot here. 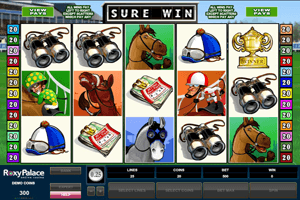 The icons that can be seen spinning on the reels of the game include a horse, a jockey, a jockey on a horse, a jockey’s helm, the golden cup, binoculars, stacks of cash, the sure win logo and a gambler. These symbols will land on the game’s 5 reels and the 25 paylines that it offers to the players. Any bets can be placed under the reels by going through the betting options that are located under the reels. The Sure Win logo of the game is the substitute symbol of the slot. This means that when the Sure win symbol lands anywhere on the reels, it is going to help players get paid by replacing any other icon. It also acts as a multiplier as any wins created with its help are tripled. The gambler icon is the scatter symbol that can trigger from 12 to 24 free spins with multipliers that vary between 2x and 4x.